Here you will find information concerning our church and its ministries. We hope you find your time spent here a blessing. Walker Pentecostal Church is a warm and loving church, and we want you to feel comfortable and at liberty to call on us for anything you need. Feel free to browse through the various areas of our website and learn about our fellowship. Service times are Sunday at 10 am and 6pm, and Wednesday at 7pm. Children's Sunday School classes are held on Sunday mornings after corporate worship time in the sanctuary. Additionally, we meet for prayer meeting each Monday night beginning at 6pm. We welcome you to join in all of our weekly services. Thanks to all who attended the chili taste-fair & gospel singing! 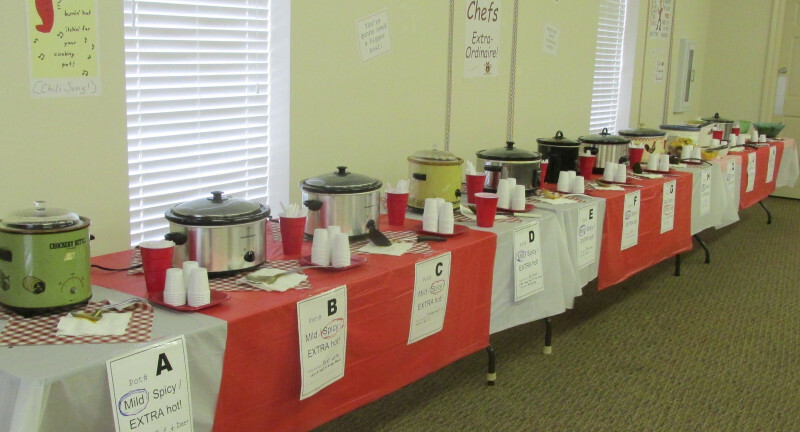 We had a great time on March 2nd for our first annual chili taste-fair and gospel singing day! Yes, we had so much fun, we plan to do it again next year! We had eleven chefs who cooked chili (including a 10 year old girl) and every pot was excellent! For the most unusual chilis, we had a man who cooked all of his meats and peppers on the grill first, and then put it together into a chili; and we had a lady who made a white bean & chicken chili. The latter could fool you as it didn't look like chili, but it tasted like any great chili. The 10 year old made a pinto bean chili, and another couple made a chili with deer meat. Some of the pots were very spicy, others were less fiery. All were so good! And then we went into the sanctuary for the singing. Our home Church singers were terrific as always, and we also had guest singers including Bro. Marlin Arceneaux, Bro. Dennis Calmes, Sis. Sue Walsworth, & Bro. Joseph Stewart. What a great time we all had in fellowship and spiritual encouragement! Y'all make plans to come next year - the first Saturday in March! Of course, don't stay away until then! !